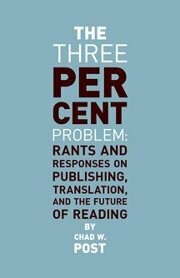 "You may already have heard about this, but to mark the fourth anniversary of Three Percent, we just released a $2.99 "best of" ebook entitled "The Three Percent Problem: Rants and Responses on Publishing, Translation, and the Future of Reading." As with other Three Percent activities, the point of this is to help support literature in translation. Which is why all of the proceeds from the sales of this ebook will go directly t...o paying translators. So you can think of this as a sort of $3 donation . . .
To try and game the system (a bit), I'm urging everyone I know to buy this book today, Friday, September 16th. That way our sales ranking will jump up and will help us get the word out to people who don't normally support literature in translation. These pieces are organized into a number of parts designed to provide an introduction to the contemporary publishing world. Ranging from pieces about the economics of publishing literature in translation, to explanation of the very different publishing scenes found in different countries, to profiles of translators, to mini-rants about book marketing, technology, and 99 cent ebooks, "The Three Percent Problem" is kind of like Andre Schiffrin's "The Business of Books," but with more swearing (and jokes). " Three bucks is a cheap donation for a worthy cause and looks to be a great read as well...if you've ever listened to one of their podcasts, you know this will be snarky and fun!